Raises your seat an additional 3.5 inches! Why are toilet seats so low anyway? 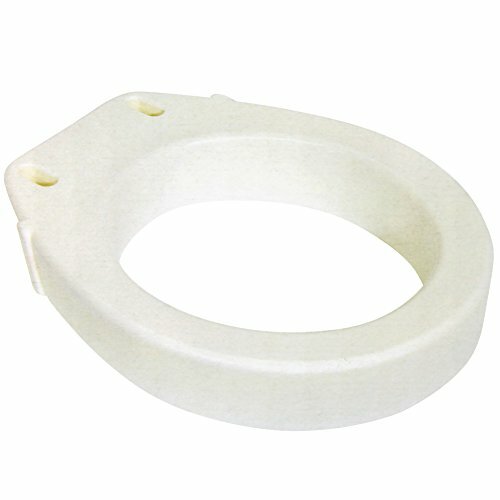 Make it easier on yourself by adding a little height to your toilet seat with the addition of this plastic seat riser. Installation is a snap. The extra-long bolts are included and you'll only need a screwdriver. Plus you can continue to use your own seat and lid. Supports up to 300 lbs. Fits most elongated toilets. Measures approximately 19" long x 14" wide x 3 1/2" tall. Due to shipping constraints, this item is not eligible for expedited delivery. Raises your seat an additional 3.5 inches. Easy installation; only need a screwdriver; Includes extra-long bolts. Due to shipping constraints this item is not eligible for expedited delivery. If you have any questions about this product by CloseoutZone, contact us by completing and submitting the form below. If you are looking for a specif part number, please include it with your message.